The Z-Curve: the Timing of Technology Spending — Mickler & Associates, Inc.
Nicholas Carr is one of the more controversial voices in my industry. Over over a decade, Mr. Carr has provided a contrarian view of IT spending and has even asked if IT spending really matters. His premise being that every technology eventually becomes ubiquitous and adopted by all, yielding businesses no competitive advantage. Crazy, eh? So his message begs us to ask, does tech spend really matter in the first place? If everyone eventually adopts technology at a ridiculously low cost an earns the same competitive differentiation from it's adoption, why are we interested in spending money on it ourselves? Core to Mr. Carr's observations is understanding where your industry is along the Z-Curve for adopting new technology. 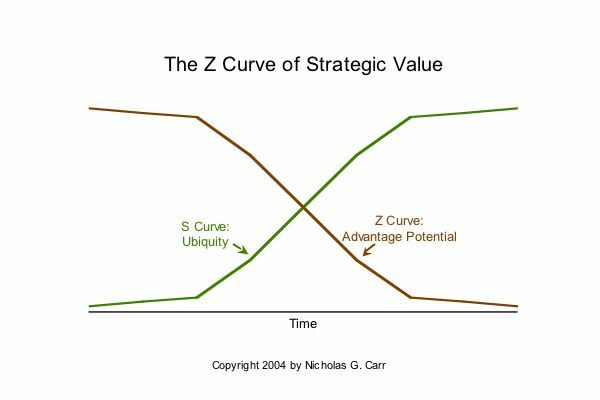 This is his Z-Curve of Strategic Value. Yes, it looks more like an X-Curve but put that aside for a moment. You'll notice the S-Curve (ubiquity curve) shows that, over time, there is a relatively limited number of early adopters who embrace the technology, but during that early adopting period, they earn the highest potential for competitive advantage because nobody else has it yet. That's the Z-Curve you're seeing there, and the gap is very wide. Now, over time, as more and more people adopt the technology, the competitive advantage gained from reducing expenses, containing expenses, or generating revenue slides off. You have a smaller range of competitive advantage because more people are applying the technology. Its cost and complexity is coming down, and more and more companies are beginning to install it. Over time, the technology becomes cheap and ubiquitous: everyone can afford it, everybody can have it, and it's now just a common aspect of doing business. What this is telling us that there's a timing involved for investing in technology that's earning first-mover and follower advantages. What's the Difference and Why Do I Care? And if we're looking to just stay in the game and be relevant - to have the same technology that everyone else does in our industry and what our consumer expects us to have - then we'd be investing in the weak advantage stage of the curve. Small business can take advantage of the Z-Curve by innovating with technology: adopting new technologies that are in the proprietary advantages segment of the curve and gain the highest rate of return. They can also plot where the weakest advantage may be earned from the technology dollar should they continue to wait for adoption. This kind of awareness is all about managing IT problems instead of just reacting to them. It's what I help my clients do every day. Newer PostShouldn't Technology Make Things Faster?